You will find tons of bounce house sellers in the popular city of Los Angeles. The long summers and frequent backyard parties make bounce house rentals very popular in this bustling city. In addition, the hot weather means that indoor playgrounds are more popular than ever because kids will stay out of the heat. 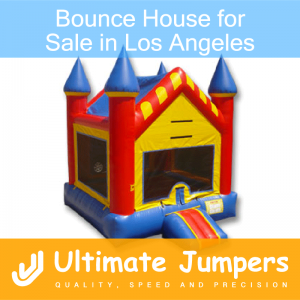 In fact, If you are looking for any kind of bounce house for sale in Los Angeles, UtimateJumpers.com has got you covered. Castle Bounce House Jumper: The kids will be able to rule their kingdom as they jump and play with friends and subjects in the castle bounce house jumper for sale. Fiesta Inflatable Bounce House Jumper: Perfect for Cinco de Mayo celebrations and any other fiestas, the fiesta inflatable bounce house jumper will make your fiesta muy caliente! Birthday Cake Bounce House Jumper: No birthday party is complete without this incredible birthday cake bounce house jumper. Princess Castle Bounce House Jumper: This beautiful princess castle bounce house will be the life of the party for princesses and their girlfriends. Halloween Bounce House Jumper: Get ready for Halloween parties with this super fun and creepy Halloween Bounce House Jumper, complete with Jack-O-Lanterns. Sports Arena Bounce House Jumper: Both boys and girls will have tons of fun bouncing around in this amazing sports bounce house jumper. The bounce houses listed above illustrate a small portion of the bounce house selection available at UltimateJumpers.com. In fact, if you you are looking for Bounce House for Sale in Los Angeles, Ultimate Jumpers also sells different types of inflatable units.